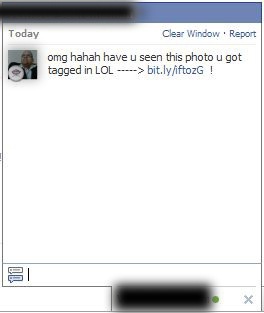 Hope you noticed that a facebook chat virus is spreading links with some attractive messages. See some sample messages here. This messages are pop up with a bit.ly shortened url of “http:// yaira .info” If you clicked any of the link it will ask for a facebook application access request. this is the last option to stay away from this kind of fake applications. If you click on “Don’t Allow” button, nothing will happen. Instead of that if you are clicking on “Allow” button it will grand the access to facebook chat.You can see the access type in the popup message. 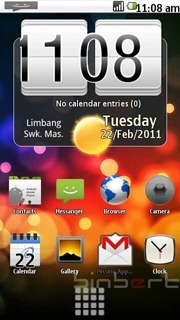 Here it is “Access Facebook Chat” Normally genuine applications will show the Icon and application name. Here the application name is “Check it”. 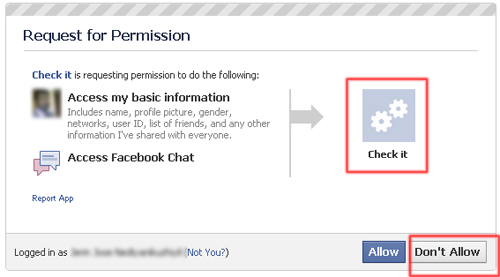 If you are permitted this Facebook application to access your Facebook chat, It will start spreading messages with infected links to your online friends. There is an option to remove this Rogue application. 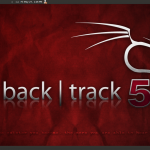 By checking infected facebook accounts we come in a conclusion that this application is not retaining access. you can check it on your Privacy settings. Also find and clean all applications which is not familiar. I too receive lots of such Facebook chat spam, and the best way is to vaoid clicking on those links, unless you are really sure that it is save. I didn’t find any app called “Check it”!!! !